Have you ever been to the coastal town #Kulasekarapattinam or Kulasai in Tuticorin district in the South Indian state #Tamil Nadu? 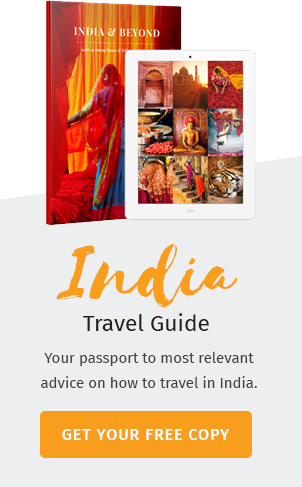 If you are a travel enthusiast or a photo fanatic or looking for something unique, then Kulasekarapattinam can be the ideal choice for you. you can witness many wonders unfolding in front of your eyes , transforming your ambience into something unbelievable in that otherwise deserted small region Kulasai, which had been a small yet successful trading port popular for the export for pearls which are quite abundant in the seashore region of Tuticorin district. Mutharamman temple which is more than 300 years old is the epicenter of this Vijayadasami or #Dussehra celebrations. The temple is so popular in the down south region of the state, where the presiding deity is a self manifested Goddess Kali. As she is worshipped with the ornaments made of the pearls taken from the sea, she is called as Mutharamman. (Pearl – Muthu, Ornament –Aram). 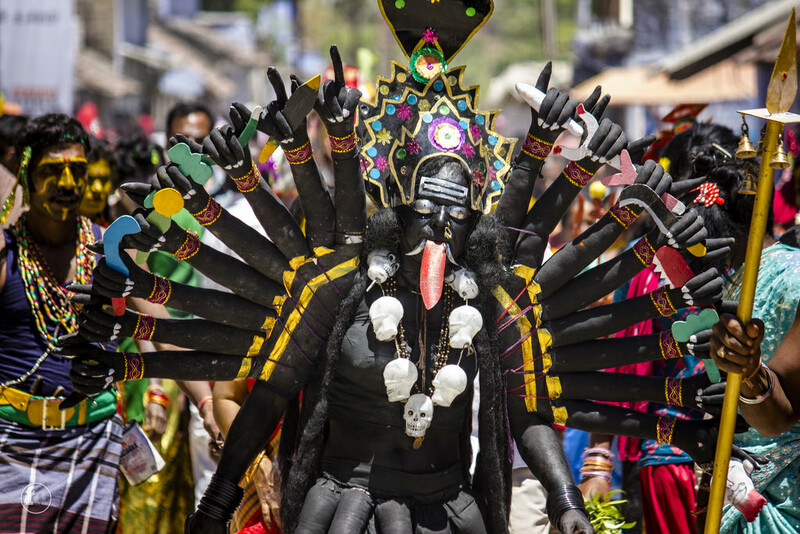 Next to Mysore in Karnataka, the Dussehra festival is celebrated in an unimaginably grand manner in Kulasai. The tenth day of the Navaratri festival which is celebrated in a pomp manner across India is completely in a different genre in Kulasai. Unlike the other places where Goddess Durga is celebrated in different forms of her incarnations, here in Kulasai, the devotees themselves dress up like Kali and other forms of Gods and Goddesses and offer prayers to the Goddess Mutharamman. After coming to know about the grand celebrations of Dussehra in Kulasai, me and some of my friends decided to keep aside all our regular works and witness this unusually interesting festival. After a long journey for six hours from our place, we were nearing the coastal town. To our surprise, we could see hundreds of people irrespective of their age, gender, caste and creed were found to dress up as Lord Shiva, Goddess Kali and even as gypsies and monkeys. We never got tired looking at them and capturing them in our cameras and we were sure that this day will be leaving its footprints on our heart forever. One of the local residents gave us the insight of the celebrations which have been in practice since ancient times. Devotees will be following the rituals strictly all through the Navaratri days. After initiating their fasting procedures on the first day with the hoisting of flags, the devotees will be staying near the temple premises and cook their own food following the strict procedures. Those who have prayed to dress up like Goddess Kali go through penance like procedures for 48 days with one meal a day, self-cooking, being ascetic staying outside the house and lot more. Not only this, we were really stunned to know that those who were dressing up like the Gods and Goddesses would go around their cities for taking alms. 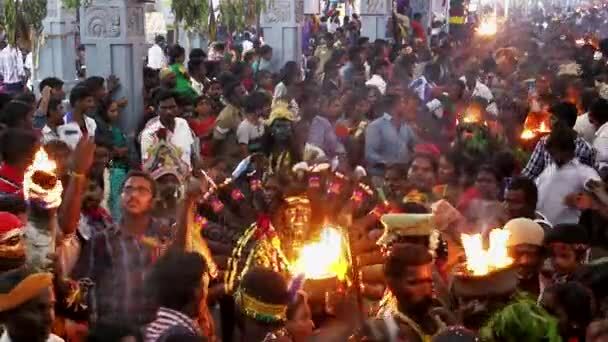 As there is a staunch belief among the people of this region that it is Goddess Mutharamman coming to their houses in a disguised form to take alms. So, the residents welcome the people happily and donate whatever they can in the form of rice or money. At the end of these festivals on Vijayadasami day, the devotees arrive at Kulasai to offer the money or the things they have collected by way of the alms taken all these days. The entire coastal region wears a festive look from the commencement of this Navratri period. Lakhs of devotees getting assembled in front of the temple. You can witness devotees carrying hot pots on their bare hands with neem leaves on the pots, dancing in front of the temple. Many of them have opted to look like Goddess Kai who is generally a furious deity. If you are weak hearted, you may get afraid looking at the unusual costumes and accessories which you might have seen only in story books describing the events on the epics. 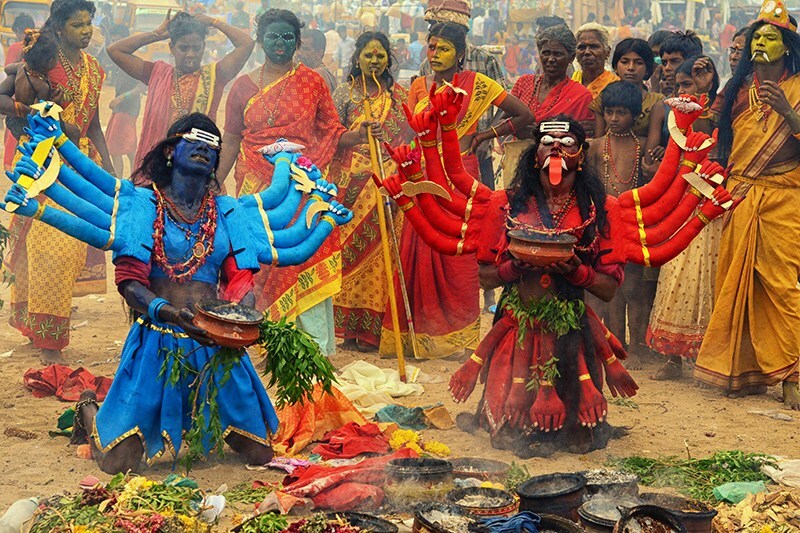 Here comes the most important part of the festival, where Goddess Kali proceeds to kill the demon King Mahishan. As per the epics in Hinduism, the demon King Mahishan emerged as an unbeatable power against the celestial Gods. As the celestial Gods pleaded to the Goddess Kali, on the day of Vijayadasami, Goddess Kali decided to kill the demon King Mahishan and this is being celebrated on the sea shore in Kulasai. Those who are in the form of Goddes Kali become so furious and dance vehemently to the tune of the musical instruments around. At last, everyone takes a holy dip in the sea, followed by the elaborate rituals and poojas, anointing with milk and other sacred materials, the entire sequence of celebrations comes to an end with the vibe spread around lasting in our memory forever. Later on, those who were in different attires, return back to normalcy and head off to their places leaving behind the sea shore and the most favorite Mutharamman temple with a hope to come again for the next Dussehra. Since the ancient times, the temple and the ocean have been witnessing lakhs of devotees who keep the traditions and culture of Tamil Nadu intact, an unique treasure which you can never experience in any part of the world. Tamil Nadu enchants you always with its ethnic traditions, culture, heritage, happenings and spirituality! Plan a tour to Kulasai this Navratri, to get an experience of life time !